Description: • Only for use with the Game Boy Color system. Not compatible with other Game Boy systems. Wario™ is back and better than ever! • Don't just defeat your enemies-interact with them to get past obstacles, open new doors and solve challenging puzzles. 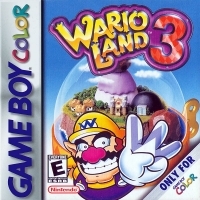 • Wario's wacky transformations may help or hinder you in your quest. Become Fat Wario, Zombie Wario, Vampire Wario and more! • Seek out the 100 Treasures to reveal secrets, open new levels and power-up Wario with even more abilities. 06-07-2016 Flashback2012 Description • Only for use with the Game Boy Color system. Not compatible with other Game Boy systems. 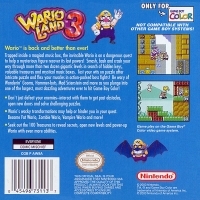 06-07-2016 Flashback2012 Box Text WARIO LAND 3 Wario™ is back and better than ever! Trapped inside a magical music box, the invincible Wario is on a dangerous quest to help a mysterious figure recover its lost powers! Smash, bash and crash your way through more than two dozen gigantic levels in search of hidden keys, valuable treasures and mystical music boxes. Test your wits on puzzle after intricate puzzle and flex your muscles in action-packed boss fights! Be wary of Wanderin' Gooms, Hammer-bots, Mad Scienstein and more as you plunge into one of the largest, most dazzling adventures ever to hit Game Boy Color! • Don't just defeat your enemies-interact with them to get past obstacles, open new doors and solve challenging puzzles. • Wario's wacky transformations may help or hinder you in your quest. Become Fat Wario, Zombie Wario, Vampire Wario and more! • Seek out the 100 Treasures to reveal secrets, open new levels and power-up Wario with even more abilities. 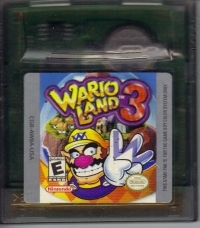 This is a list of VGCollect users who have Wario Land 3 in their Collection. This is a list of VGCollect users who have Wario Land 3 in their Sell List. This is a list of VGCollect users who have Wario Land 3 in their Wish List.